Morton was born on August 19, 1819, in Charlton, Massachusetts. He studied dentistry at the Baltimore College of Dental Surgery and Harvard Medical School. In 1844, after a brief partnership with dentist Horace Wells, he opened his own dental practice in Boston, Massachusetts, and began to investigate ways to deaden patients’ pain during dental procedures. Morton consulted the physician Charles Jackson, his former teacher, who suggested administering sulfuric ether as a general anesthetic. Morton experimented with this method and in 1846 successfully extracted the tooth of a patient anesthetized with sulfuric ether. Later in the same year, he removed a tumor from a patient’s face in the first public demonstration of surgery under ether anesthetic. The successful demonstration, performed at Massachusetts General Hospital, convinced spectators of ether’s efficacy. In 1847 Morton published directions for the use of ether and its potential dangers in Remarks on the Proper Mode of Administering Sulphuric Ether by Inhalation; this new method of anesthesia quickly spread through the United States and Europe. Morton and Jackson obtained a patent for the use of ether as a general anesthetic in 1846, but Morton subsequently attempted to claim sole credit for the discovery. Jackson contested Morton’s false claim, and the two spent years in costly litigation. Another physician, Crawford Long, also claimed credit for pioneering ether anesthesia; Long had successfully removed a neck tumor from a patient anesthetized with ether in 1842, but he had not published his results until 1849. 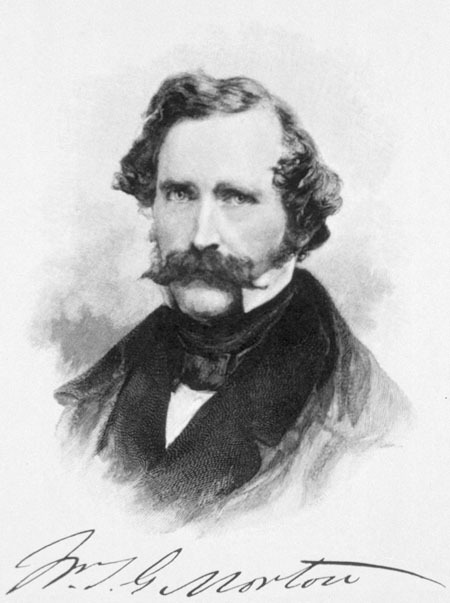 The British government offered Morton a monetary reward for the introduction of ether anesthesia, but Jackson opposed the gesture, and the offer was withdrawn. The French Academy of Medicine proposed to pay a sum of money to both Morton and Jackson, but Morton refused. In the 1850s the United States Congress failed to pass three bills that would have awarded Morton $100,000 in recognition of his achievement. Morton died in poverty in New York City on July 15, 1868. Morton’s pioneering work led to the widespread adoption of sulfuric ether anesthesia by dentists and surgeons, which improved surgical conditions and broadened the range of possible surgical procedures. The introduction of sulfuric ether anesthesia led to the discovery that chloroform behaves as an anesthetic agent as well. In 1847 Marie Flourens of France presented a paper announcing the anesthetic effects of chloroform and comparing them to those of sulfuric ether. Her paper went unnoticed until James Young Simpson performed a public demonstration of chloroform anesthesia later that same year. Chloroform is less irritating to the eyes and nose than sulfuric ether. Chloroform became prevalent as an anesthetic in childbirth. In the 1850s John Snow delivered the children of Queen Victoria using chloroform anesthesia. Chloroform was soon being used more often than ether in childbirth. Snow specialized in anesthesiology (the first physician to do so) and developed the chloroform inhaler, a device that controlled the amount of vapor the patient inhaled. In modern times, anesthesiology is a specialized branch of medicine in which anesthesiologists use the pain­killing properties of numerous substances to control pain and sensation during and immediately following surgical procedures.